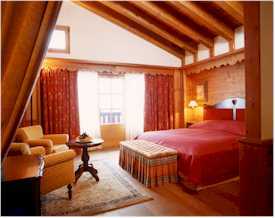 ABOVE: Rooms in Zermatt's Riffelalp Resort are decorated in traditional Swiss country style. The Swiss hotel industry has a reputation for high standards. Guidebooks will tell you that even an inexpensive hotel in Switzerland is likely to be clean, and that's generally true. It's also true that Swiss hoteliers are sought after to manage prestigious hotels around the world. Still, hotels in Switzerland do have their idiosyncrasies, and these endearing little foibles can be disconcerting to foreign tourists who don't know what to expect. If you stay in an older hotel or a cheaper room, your accommodations may be long and narrow, with the beds laid end to end. This isn't an ideal arrangement for cuddling or conversation, but it doesn't seem to bother the Swiss (although it may explain their country's low birth rate). There is one advantage to the separate-but-equal bed approach: Two people won't end up rolling toward the middle of a sagging mattress. Think of that when you're about to join your partner and your knee gets jammed in the space between the bed. The Swiss like to sleep without a top sheet and blanket. Instead, they lie under a Decke or duvet--i.e., a feather or down comforter tucked inside a sheet bag. Sleeping beneath a Decke may take practice. If you're warm and you'd like to push the covers down, you can't...at least, not without roasting the lower half of your body. If you're tall, your toes may be exposed whenever you pull the duvet up under your chin. And if you toss and turn during your sleep, you may wake up and find that you've kicked the comforter onto the floor. No matter. After the first day or two, you'll get used to it. And you'll like the convenience of taking a nap, then giving your Decke a shake to create the illusion of a freshly made bed. BELOW: Here's one way to keep your child from falling out of bed. For a country that seems obsessed with standards, Switzerland gives an unusual amount of freedom to its toilet designers--as you may discover the first time you try to find the flushing mechanism on a Swiss W.C. Some toilets have a ceramic knob protruding from the tank top. Lift it, and you'll hear a satisfying whoosh. Another model has a large black plastic button embedded in the right side of the tank lid. Press, and the water will rise and recede. You may find other toilets (mostly in public places) that are flushed by a circular button in the wall or floor. When in doubt, use your ingenuity--or get down on your hands and knees and search. While we're on the topic of toilets, it's worth mentioning that Swiss toilets usually have a slight shelf-like protrusion molded into the bowl's interior above the waterline. This is to help digestion-obsessed Europeans inspect the quality of their output before flushing. We wouldn't mention it here except for the fact that, because the water reservoir is so shallow, the toilet may become soiled after use. Not to worry! The Swiss thoughtfully provide a scrub brush next to the toilet to facilitate cleanup. And yes, it's your job to scour the bowl's interior and leave a clean receptable for the next visitor. Don't neglect this chore, or the locals will regard you as an ignorant (not to mention unhygienic) foreign lout. If you decide to save money by taking a room without a private bath or shower, you'll need to use the bathing facilities down the hall. And in some cases (most commonly in budget hotels), you'll have to pay extra for that full-body soaking. If you're able to open the door and you discover a shower with a coin-op mechanism, it means you'll need to insert money before you can get wet. The mechanism has a timer, like a do-it-yourself car wash, so save your singing for after the shower (preferably on a mountain trail where the other guests won't hear you). Tips on hotels, guesthouses, private rooms, apartments, villas, chalets, campgrounds, and youth hostels, with links to sites where you can get more information or book a room.